North Korean Leader Kim Jong-un has arrived in Beijing seeking a breakthrough in denuclearization talks and ways to improve ties with the US, as 2019 could be as seminal to North Korea as 1979 was for China when reform and opening-up was first launched, Chinese analysts noted. At the invitation of Xi Jinping, general secretary of the Central Committee of the Communist Party of China (CPC) and Chinese president, Kim Jong-un, chairman of the Workers' Party of Korea and chairman of the State Affairs Commission of the Democratic People's Republic of Korea (DPRK), is visiting China, a spokesperson said on Tuesday, the Xinhua News Agency reported on Tuesday. Kim is set to visit China from Monday to Thursday, said a spokesperson of the International Department of the CPC Central Committee in Beijing. As discussions of major issues at the beginning of a new year have become a tradition of China-North Korea relations, Kim is likely seeking advice and assistance from China, Wang Junsheng, a research fellow on East Asian Studies at the Chinese Academy of Social Sciences in Beijing, told the Global Times on Tuesday. "The reason North Korea can take the daring step toward denuclearization and engagement with the US is mainly because of its trust in China," Wang Sheng, a professor of international relations and expert on the peninsula issue at Jilin University. Kim is also expected to seek further support for his country's economic development, Wang Sheng noted. "In 2018 the two sides had exchanges and communication in many fields, including the arts, sports and culture." Kim is expected to hold his second meeting with US President Donald Trump, and visit South Korea for the first time in 2019. 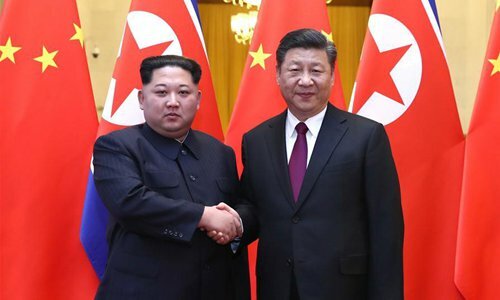 Kim is planning for a new era after his second summit with Trump, which might open his country to massive development opportunities, Wang Junsheng said. "For North Korea, 2019 could likely be similar to 1979 for China," said Wang Sheng, drawing a parallel to the year China and the US established formal diplomatic ties and China's reform and opening-up began.